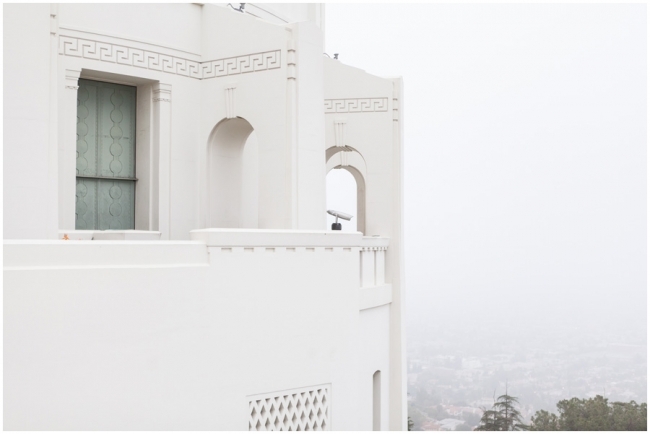 Occasionally, I visit a location and think to myself ” This would be an AMAZING place for a photo shoot!” One of these such places is the Griffith Observatory. There are gorgeous views and a variety of clean yet interesting backgrounds. Not to mention, the Griffith Observatory is a classic Los Angeles landmark. The ideal time to go to the Griffith Observatory for portraits is in the morning before they open. Before opening there is a greater likelihood that you won’t get crowds of people in your shots. And when I say morning shoot, I really mean a SUNRISE shoot! Light is at its most gorgeous 2 hours after sunrise and 2 hours before sunset. So the ideal time ( for this season) would be between 7:30am and 9:30am in the morning. So this shoot would be perfect for early risers and morning people! Insert couple and this image would be wall canvas status! If you are interested in a photo session at Griffith Observatory and don’t mind waking up early, please contact me to set up a session! If you do mind waking up early, contact me anyway and we will make it work or we can always go to another location of your choosing.